Explain briefly the construction and working of bull’s Trench kiln? question:Explain briefly the construction and working of bull’s Trench kiln? Answer: It is a continuous kiln generally oval in plan.It is 50 to 100 m. long and 1.5 -2.5 m deep below ground level.It is divided into 8-12 sections. The dried bricks are stacked in the kiln with spaces in between them for circulation of hot gases and forming fuel galleries over which vertical shafts at 60-90 cm interval are provided to provide fuel. Bricks are stacked in section of about 3.60 m length having 20-30 thousands bricks in a section. 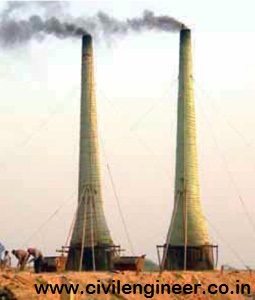 When one section is being burnt,the hot gases are allowed to pass through the next section before escaping through chimney.It takes about 24 hours to burn the bricks in one section with temperature variations of 800 -1000.So in the kiln when one section is being unloaded ,the next two sections are left for cooling, one section shall be under fire and one under pre-heating , other one in smoking while last two sections are under loading loading.But it is difficult for kiln to work in the mansoon season. Its out put is about 30000 bricks a day. Previous What methods are used for burning of bricks? Next What is a Hoffman kiln and how it works?